If you have more to add, please discuss, modify or send me an email at torsten@eymann.net. Some websites offer the opportunity to discuss name-related questions. Ancestry has forums organized by surname, so we will largely use this probably. You can find the most active board here: http://boards.ancestry.com/surnames.iman/mb.ashx . There is no specific Eyman, Eymann or Eimann board, so we should probably stick with the Iman board to gather all relevant information there. I had subscribed to feeds at GenForum earlier, so please check for archived information and existing questions and answers at http://genforum.genealogy.com/eyman/ or http://genforum.genealogy.com/iman/. GenForum discontinues this service by September 30, 2014, but they promise to let the existing discussions to be available as "read only". Over the years, I have uploaded many GEDCOM files to different genealogy sites. If you encounter slight inconsistencies, this might be the reason. Please, instead of putting post-ems to this board, please send me a mail to torsten@eymann.net instead! Post-ems will be lost the next time I update the tree! I have not paid yet for accounts at ancestry.com or myheritage.com, so you will not find updated trees there. What does the Eymann crest show? This is the Eymann family's heraldic shield / crest (not to be mistaken as a sign of nobility, probably dates from around 1880). In the late 19th century, the romantic age and the nationalistic movement led even peasant and citizen families to creating their own coat of arms. This development is mirrored in the Eymann heraldry, as there was no visualization of the name before. The shield is a graphic representation of the name "Ey-mann". "Ey" denotes in a certain German dialect, Bernese Swiss German, a meadow by a river that is frequently flooded (today's German would read "Au". In English language, the "is-" in isle or island has the same linguistic root). Until today, those meadows who lie directly at the river banks and which are flooded during high water seasons are denoted as "Ey" in swiss maps. Which is what you see in the crest. If you happened to possess this meadow as a farmer, then you became in 1530, when lastnames where introduced, the "Ey-man" to distinguish your family from the other families in your village. 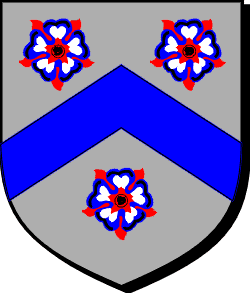 The shield shows the river as a blue ribbon flowing through the middle, and three so-called heraldic roses which stand for the meadows or any vegetation. The blue stripe (called a “chevron”) is a stylized symbol for a river, which flows through a bend. The roses are heraldic, meaning that they are not really roses, but also stylized symbols for any plants, e.g. grass. So what you see in the crest is a bird's eye view of a river, flowing through meadows. Which explains the name in a visual way. This kind of crest, which is constructed out of several heraldic modules, is very difficult to date. It is no clear when it was invented and what the reason for its existence is. The Eymann family have been poor farmers for most of the centuries, and a crest was mainly used by noble families (where it was necessary to mark their possessions even for the illiterate). Where does the Eymann name come from? I found your website from http://www.imanfamily.net/europe/index.html the Iman/Eymann family website. I have been working on my genealogy and have Amann /Eymann names in my tree. I took the ancestry.com DNA test and have found a few DNA matches to people with Iman in their family trees. My 9th great grandfather was Johannes Amman, b 1591 in Böttstein, Aargau, Switzerland. Short version: No, we are not related. Eyman/Iman and Amman are to distinct families. Long version: In the 15th century, surnames or family names were invented to distinguish people because of increasing village sizes. http://en.wikipedia.org/wiki/German_family_name_etymology#Nachname gives a quick overview on the development in Germany and Switzerland. When answering your question, of the given possibilities for name derivation, 2 out of 4 apply in this combined case. Eymann as geographical name: "Ey" denotes in a certain German dialect, Bernese Swiss German, a meadow by a river that is frequently flooded (today's German would read "Au". In English language, the "is-" in isle or island has the same linguistic root). If you happened to possess this meadow as a farmer, then you became in 1530, when family names where introduced, the "Ey-man" to distinguish your family from the other families in your village. The shield shows the river as a blue ribbon flowing through the middle, and three so-called heraldic roses which stand for the meadows or any vegetation. In High German very frequently exists the name "Aumann", which has the same origin. Eymann as job designation: In today's German, the vowel "y" has mostly been replaced by "i" . This also happens for "Ey" --> "Ei", and "Ei" in English is simply "Egg". The Eymann as a job designation thus is the "Egg-Man", and the Eymann family from Westphalia around the city of Osnabrueck in northwestern Germany, who are not related to the Swiss Eymann family, probably were chicken farmers. Their heraldic shield (crafted in the 19th century) holds a golden egg. Ammann as job designation: http://en.wikipedia.org/wiki/Amtmann: In Switzerland the Ammann (Amtmann) was an office, since the Middle Ages, elected by the citizens who was the leader of the executive of a canton (Landammann), a town (Stadtammann) or a parish (Gemeindeammann). This is stable, as long as we are in the German language. During the 18th and 19th century, however, many German and Swiss family members emigrated from Europe to North America. When crossing the Anglosaxon language border, they sometimes changed their family name so that it was easier to spell and understand in English. This is why any family name that ends on "-mann" may lose the second "n" to become "-man" -- this does not change anything semantically. More complicated are those cases where the acoustic of the spoken name is dominant, as in "Eyman" to "Eyeman" or "Iman"; "Ammann" to "Emmen" -- and maybe, in some very rare cases, that both German names "Eymann" and "Ammann" map onto the same changed spelling in English. I hope I could clarify a few things with my post, and if you have more questions, do not hesitate to comment on this.